It is fake because there are exactly 3000milion transistors. I'm not claiming an all around superiority, only when they have been faster and I'm speaking about performance as that is what the discussion was about. Product superiority is something that cannot be objectified: performance, features, F@H... it all depends on what people want off the cards. But to say that Nvidia has only been faster because they have crippled Ati's performance is stupid and based on nothing but superstition, lack of any understanding or lack of any desire to understand and a lot of FUD cleverly spread by some people since a long time ago. An example of that superstition and lack of understanding is how people still mention Assassins Creed, when it just takes a little bit of understanding and common sense to know TWIMTBP had nothing to do with it. AC was a TWIMTBP game from the start. If Nvidia wouldn't want DX10.1 on the game and Nvidia had the influence that these people attribute them, it would have never been released with DX10.1. It's far easier to take a feature down before release than just after release. By the time AC was released the HD3xxx cards had 6-7 months. It just takes one, 1 Nvidia employee buying a single Ati card an testing. You can't think Nvidia is guiding a massive and perfectly covered conspiracy (there's no proofs, out of all the people that should be involved not a single one says anything) and think they would fail to notice that HD3xxx cards were faster. Specially when you are claiming their job is exactly looking how Ati cards perform and crippling them. You can't put the two things under the same logic. that pixel and texture fillrate seems a tad low! it might be fake but its not that wrong. That's the part that would make sence, no support in older drivers. I beat the Texture fillrate almost with stock clokcs. Same core and I get 47,6GTexels/s. 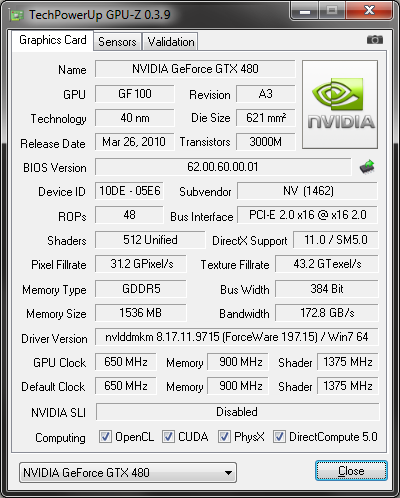 But memory is too low, GTX 470 had 1300MHz in the leaked specs (if they were true). Really, a bias opinion. A successful company built upon non-superior products, you gonna need solid proofs. I may not old enough to know too far way back of both companies, but the results usually show the truth. how about a precedent: apple. There are plenty of different threads in the News section on this topic now. Take your on topic discussions there. The amount of cleanup constantly needed in this thread is ridiculous and it has run its course. There are plenty of threads on Fermi in the Nvidia subforum. Since most news/information about Nvidia will be centered around their new cards, having one thread for everything isn't going to work anymore. If you want to partake in a particular discussion in relation to these cards, again penty of threads at your disposal in the Nvidia subforum. If you have a particular piece of information/questions/advice not covered by any recent threads. Start a new thread.